One of the various galvanised ropes we make in-house, this 6×7 construction product is available in diameters ranging from 1mm to 16mm. Sitting a little way down the line up, this 5mm 6×7 Galvanised Wire Rope example delivers on expectations of flexibility and durability for a versatile result. To produce this rope we match a fibre core with six bundles of galvanised steel wire, each containing a total of seven strands. By using fibre for the core, the rope remains easier to bend and work with, while sacrificing relatively little in terms of capacity. The 5mm diameter allows for a 1,658kg WLL and a breaking force of 16.27kN. Another boon of the 6×7 structure of this wire rope is that its external surface is not as rough and abrasive as some of its siblings. This makes it less of a hassle to handle and also restricts the wear and tear that it might cause. Rope Services Direct is equipped with the modern machinery and methodologies to take a blank length of rope and deck it out with attachments such as terminals, sockets and a bevy of other fittings that will help you complete troublesome tasks. We supply assemblies made using rope of all kinds, along with tools that give you more adaptation options further down the line. 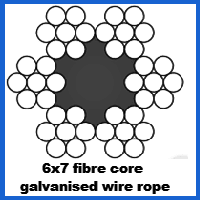 It could not be simpler to order 5mm 6×7 galvanised rope from us. Either email our experts or give them a call on 01384 78004 to add your order to our books. 5mm 6x7 Galvanised Wire Rope Overall rating: 5 out of 5 based on 6 reviews.